"That was too close! You were almost a Jill sandwich!" While I don't normally like survival horror games or zombie games, I have a special place in my heart for the original Resident Evil, you know, the one that came out in 1996 on the Playstation? Wow, that game really blew me away back in the day. In 2002, a critically acclaimed remake was released on the GameCube and now, more than a decade later, we've got a remaster of that remake. 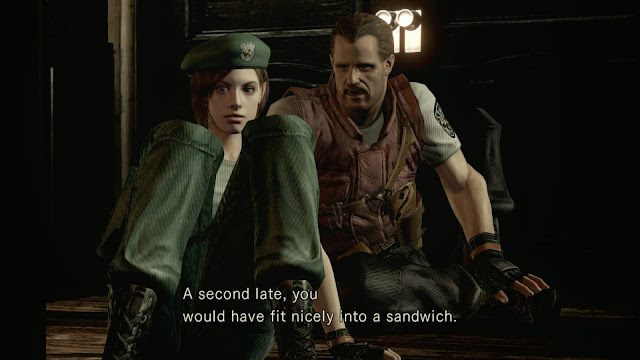 So this is basically Resident Evil: The Remake: The Remaster. Still with me? Good. Anyway, I've got my mate SirWraith to thank for this generous gift. He's quite a big fan of the original game so he just wanted to share the love. While I'm nowhere near finishing the game I have played it enough to give some initial thoughts on it. So am I having fun with this game? Is it as good as the original? Quite faithful: This is a very faithful remake to the original so it's definitely catering for the "purist" crowd when it comes to remakes. The maps are practically the same and so are the room puzzles. They even kept the mini-loading screens each time you opened a door. They did get rid of the mini-loading screens when you climbed up and down stairs though - thank God. Better graphics: The graphics are pretty good, considering this is a remaster of a game that came out in 2002! Character models look good and there are apparently several other graphical improvements such as the use of non-static 3D models for the backgrounds (instead of what they call "video backgrounds"), bloom effects, higher resolutions and widescreen support. Sharper audio: The quality of the audio is definitely better and so is the voice acting. There's also support for 5.1 channel surround sound now. Same soundtrack: I'm not sure if they re-recorded the soundtrack but it's fantastic that they managed to use the same themes from the original. They fixed the voice acting: This isn't really a valid criticism since now the game has better voice acting. It's still not fantastic at times but it's a lot better than the original including the scriptwriting. Although I still kind of miss the original since the voice acting was so bad it was good, hilarious even. Still very much console-friendly: You can use keyboard and mouse to play this and while it's functional it feels a bit clunky, especially when you start navigating the status screen. It's obviously optimised for a controller. Camera angles: I know the camera angles weren't that great in the original and that's part of the suspense: not knowing where exactly that zombie is lurking about but hearing him moan and groan nonetheless. There is no denying that it can be annoying sometimes, especially when the controls keep changing direction each time you move to a different scene. No FMV: Again, another criticism that's probably invalid. I really enjoyed the cheesy FMV scenes in the original game. These are gone and have been replaced with 3D graphics. "Breast physics": If you play as Jill Valentine in the game it won't take long to realise that CAPCOM must've hired Dead or Alive's Team Ninja to finetune the "breast physics" in the game. Hmmm I suddenly feel hungry for some jelly. The game is more-or-less a faithful remake of the original Resident Evil, which is a good thing. Resident Evil strikes a good balance between suspense and moments of sheer terror and panic. The game even has some basic adventure game elements which you don't tend to see in modern zombie games (except for, of course, The Walking Dead) which is probably why I ended up liking the original in the first place. Definitely keen to continue playing this one.